You would think now that I moved into the metropolitan area of Tokyo and take a 28-minute subway trip from my apartment to my school, that I would no longer want or need my car. Well, this is Jalopnik, so we know that can’t possibly be true. And it sure as hell isn’t. Access to a car represents something to me, and no doubt to you, that it often doesn’t represent to the “cars are appliances” masses. Cars are freedom. Without my car, my freedom of movement, my freedom to transport, and indeed my freedom of choice would be severely curtailed. Even in Japan, trains do not go everywhere, and even the places that they go are not always timely or economical. In many of the rural places I have lived, a car has been an absolute necessity, because there was either no train between where I lived and where I worked; or, as in the case over the last couple of years, there has indeed been a train route, but that train route would have meant two hours added onto a commute that took me 25 minutes into the next town over. Screeeeew that. Unfortunately, I have spent the last two weeks moving into my new apartment, and it has meant multiple trips from Saitama to Arakawa. Due to the expense of my apartment and some outstanding debts, I did not have the approximately $400 in cash to hire a moving company or even to afford the cost of paying someone to cart away my trash. I had to do it all myself. I tried my hardest to shrink down everything I owned before the move. This wasn’t an easy task. I went through my entire closet and ended up selling boxes of clothing to a local recycle shop. I gave away or sold furniture. I even took a hacksaw to very old pieces of furniture (including an entire couch) that were far beyond giving away, let alone selling. In the end, I still had enough stuff to fill three Honda Logo GAs. It was far more than I could ever have managed to transport via the train system. This is precisely the reason, especially living in more rural areas of Japan, I have always insisted on having a car. I cannot imagine the trouble I would have been in had I not been able to spend two weekends driving back and forth from Saitama to Arakawa with the loaded up GA. I had to move a rather heavy microwave today by hand and by subway, and that was a deeply unpleasant experience. Now that my car is currently camped out in Gunma at a friend’s place, I can’t easily use it for things that normally I would be able to do. My new apartment has only what I brought into it, and my previous appliances belonged to my previous apartment. Thus, I have no washing machine, no dryer, no refrigerator, etc. I would save a lot of money if I was able to drive to a recycle shop and purchase them used because recycle shops rarely do delivery. It would introduce too much overhead. 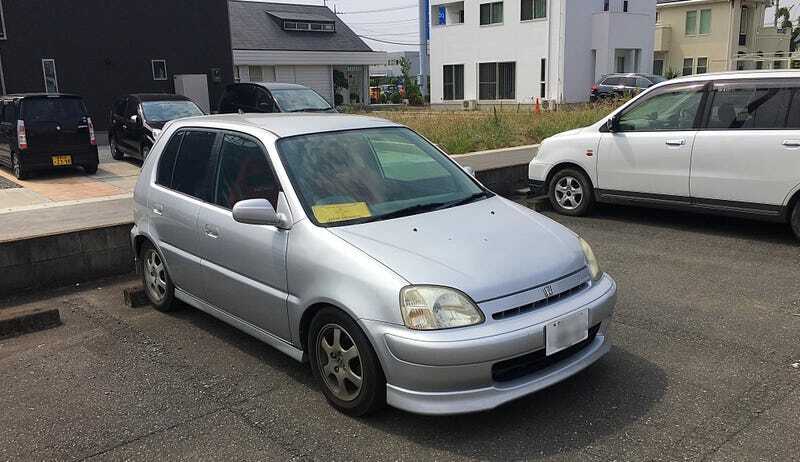 I also recognise that one of the greatest advantages I have had over the past several years has been my ability to drive in Japan, and now, owning my own car. It means that I can take work in very rural areas that others might not, especially if it involves my international skills, my native English, my teaching abilities, or all three. I like the inaka (rural Japan), and I don’t like the city. For me, having my car makes it much less likely that I’ll have trouble finding a job if I lose the one I have. But even more than the horrid feeling of helplessness I feel when it comes to not having my car around to do cargo duty is the understanding that a weekend drive through the mountain curves of Saitama and Gunma is no longer a matter of just “I feel like going, so I’ll go.” But it would be even worse if any time I wanted that feeling and was able to put in the planning for it, I’d have to borrow someone else’s car. Ewww. No. I will drive my GA (or a replacement vehicle of my choice sometime in the future) where I want to drive it, when I wish to drive it, because it is therapy. It is de-stressing. My little Logo is freedom every time I get in it. Tokyo, with its urban density unmatched, won’t take that away from me without a fight.